I just saw this. Given I'm clearly on an https site, I suspect my password manager, LastPass, isn't dealing with the popup login box correctly. But is it really possible there's something insecure here? Chrome 72.0.3626.96 on Win10/1809. Anybody else see anything like this? I hope this helps! If you would have any further questions, please don't hesitate to let us know. Unfortunately, I got the same message using the shorter URL. LastPass explains here -- https://lastpass.com/support.php?cmd=showfaq&id=7336 -- what causes them to issue that warning. There is a perhaps-relevant discussion of the security of GET on stackoverflow (see https://stackoverflow.com/questions/37328684/should-i-use-get-or-post-when-requesting-sensitive-data). 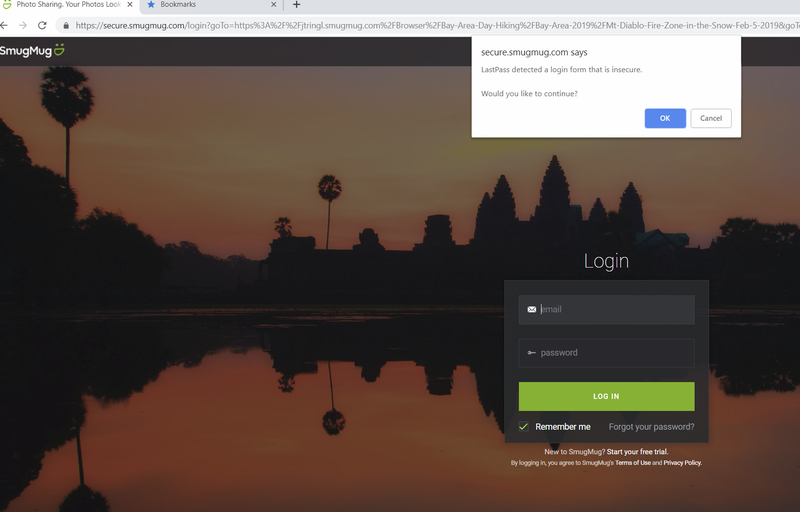 With the login page being https, I'm not all that worried about security, but I did want to a least flag the situation so you were aware of it. It is odd that I'm seeing it in Chrome but not in Firefox. BTW, I asked here, rather than going right to the help desk, to see to see if anybody else had come across this. From the resounding quiet, it appears not.